How Zealous Is Too Zealous? Panel ponders gendered critiques of female advocates. 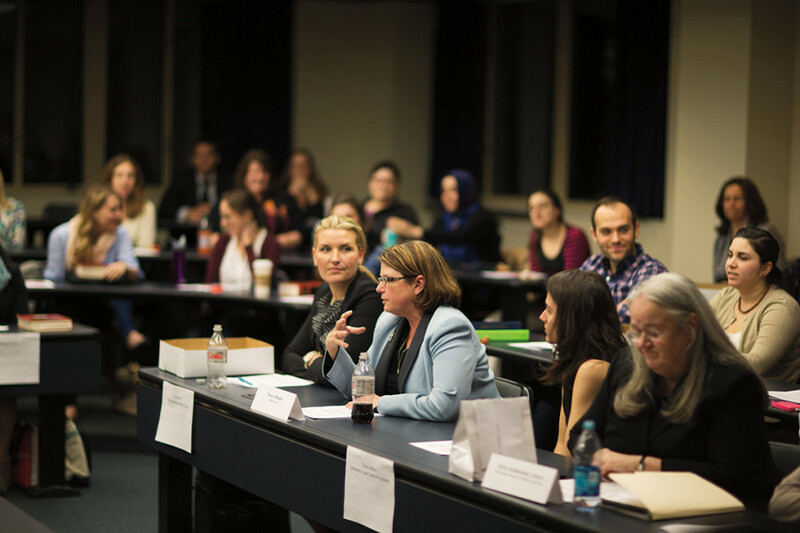 After a number of women students in advocacy competitions were criticized for being too aggressive—and worse—they organized a panel discussion to bring public awareness to the issue and to seek the advice of women practitioners. 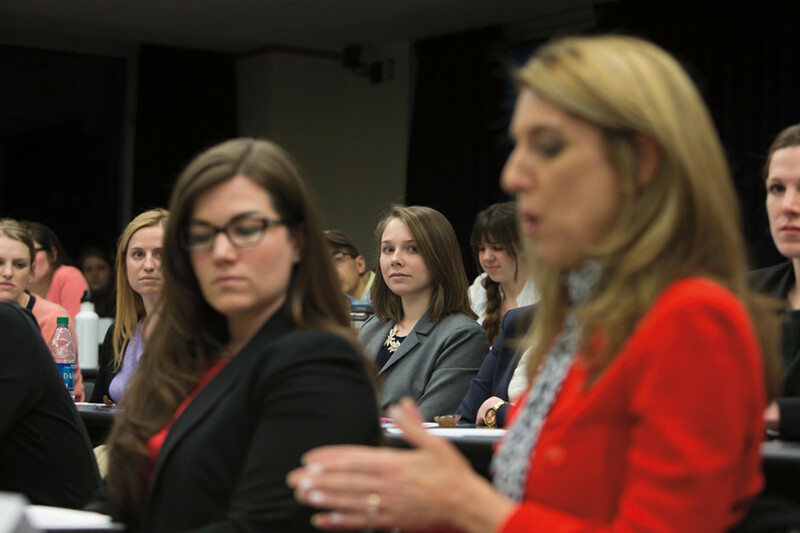 As I listened to my female classmates share these stories, their experiences resonated with my own. While advocacy competitions have been a highlight of my time at the Law School—and I have grown tremendously because of my participation—I too occasionally came across a moot court judge who warned me against being overly passionate and a mock trial judge who felt I was too emotional in my closing argument. 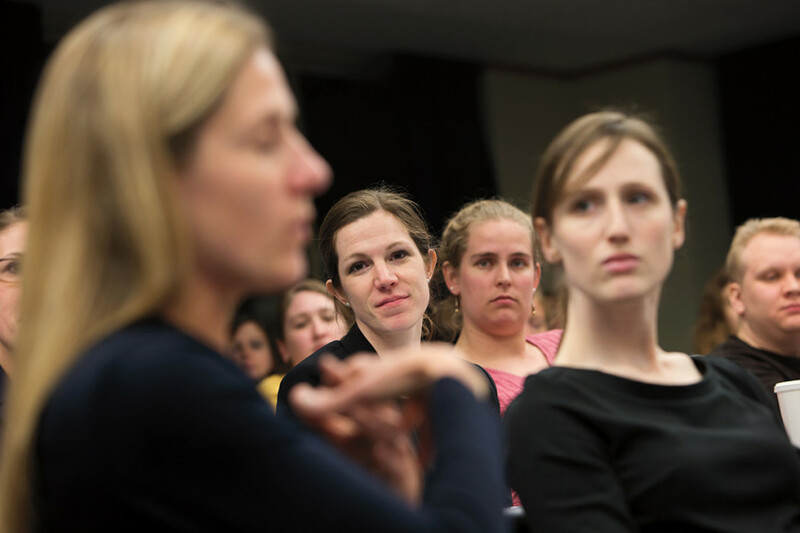 In response to these experiences, this past spring a group of women on the 2013-14 BC National Moot Court teams decided to circulate a survey to the men and women at the Law School who had participated in competitions and ask them to share their experiences of gendered critiques. 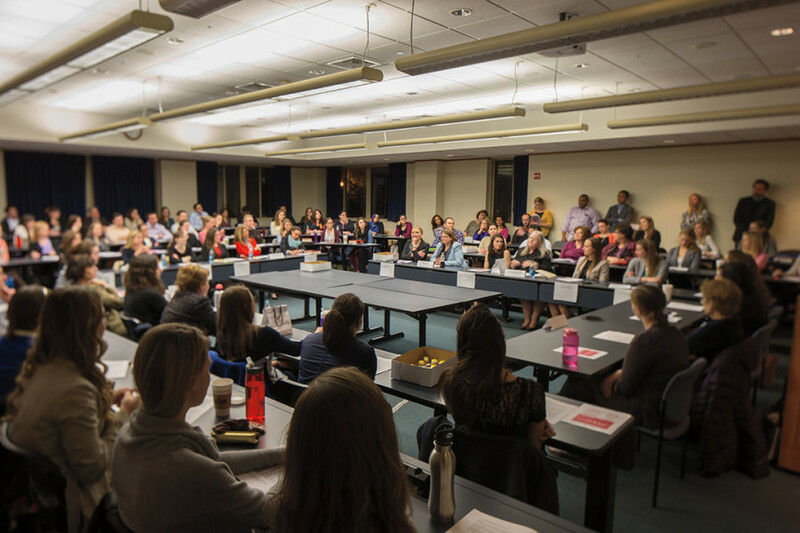 Once we had this information, we invited seven female practitioners (see sidebar) to campus for a roundtable discussion entitled “How Zealous Is Too Zealous for a Female Advocate?” East Wing 200 was overflowing with students and alumni who wanted to engage in the discussion. 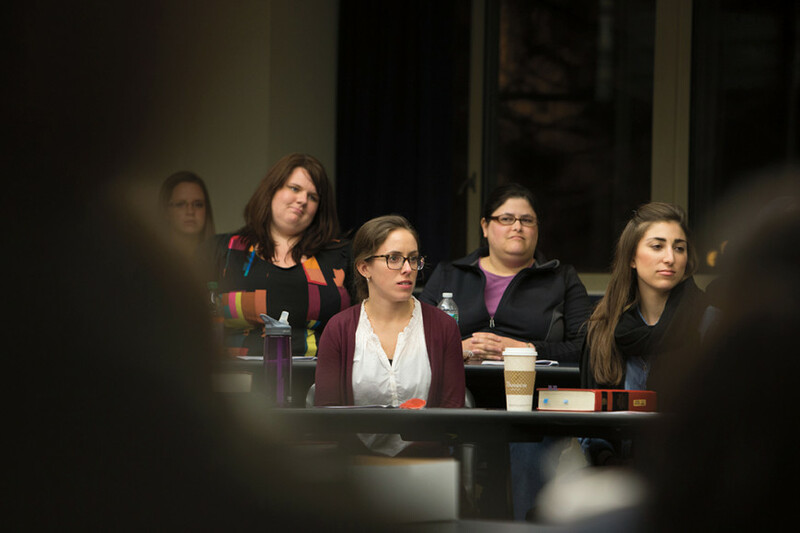 The practitioners discussed their reactions to the BC Law students’ experiences. Some of them had faced these same critiques when they competed in Law School competitions. Others shared their own experiences with gender expectations in practice. When asked directly to describe how zealous is too zealous, many of the panelists said that the question depended on the situation and the court, but that an advocate is always too zealous when they lose their audience. 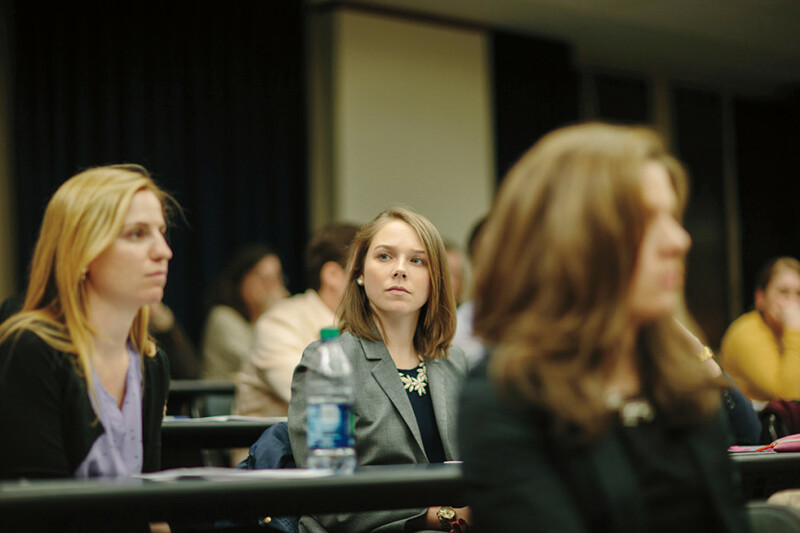 Despite these factors, though, the consensus seemed to be that there are different expectations for women and men when it comes to level of force in the courtroom. Given this reality, and because we cannot change our audience, the panelists offered the students in attendance this advice: 1) confront the problem through preparation, 2) develop a thick skin, and 3) come up with strategies to succeed despite it. At the end of our event, male moot court team members volunteered their observations. Not only did they notice their female teammates facing gendered critiques, but they could recall the rounds where they were made, the phrases that were used and described them as unfair. After a constructive and important discussion, it is our hope that this conversation continues on long after we graduate. This event was never meant to solve any problems overnight, but instead to bring this issue to the forefront of our community’s consciousness. Jasmin Ali ’14 was the 2013-2014 editor of the Uniform Commercial Code Reporter-Digest Journal and president of the American Constitution Society. She received the Best Oralist Award in the 2013 BC Law Moot Court Competition. As a summer associate, she worked at the firm Bingham McCutchen, State Street Bank & Trust, and the Middlesex District Attorney’s Office. Justice Margot Botsford, Massachusetts Supreme Judicial Court. Prior to being appointed to the Massachusetts Supreme Judicial Court in 2007, Justice Botsford served as an Assistant Attorney General and an Assistant District Attorney in Middlesex County. She also practiced law at Hill & Barlow and at Rosenfeld, Botsford & Krokidas, and was an Associate Justice of the Superior Court for eighteen years. Jacqueline Doherty ’14, along with being a Semi-Finalist at Boston College Law School’s 2013 Grimes Moot Court Competition, also competed on BC Law’s European Union Moot Court team that finished as Regional Finalists in Braga, Portugal. As a 3L, she worked as a judicial intern for the Honorable Spencer M. Kagan at the Middlesex Probate and Family Court. Jessica Frattaroli ’14 was the 2013 Grimes Moot Court Competition Winner and the Best Finals Oralist recipient. Her team was the 2013 Mock Trial Runner-Up, and this year she competed on BC Law’s National Moot Court team that finished as National Quarter-Finalists. She will be clerking in the Massachusetts Appeals Court for the Honorable Judge Peter W. Agnes Jr.
Lisa Grant ’96, Committee for Public Counsel Services (CPCS). Grant has been with CPCS since 1997 and is currently the Managing Director of the Southeast region of the Public Defender Division, responsible for eight trial offices in Norfolk, Plymouth, Bristol, and Barnstable counties. She is a member of the Massachusetts Association of Criminal Defense Lawyers. Marianne LeBlanc ’93, Sugarman. A trial attorney practicing in the area of serious personal injury litigation, LeBlanc joined the Boston firm of Sugarman in 1993 and has been a principal of the firm since 1999. She is past chair of the Women Trial Lawyers Caucus of the American Association for Justice and of the Civil Litigation Section of the Massachusetts Bar Association. Adrienne Lynch ’80, Middlesex District Attorney’s Office. A prosecutor in the Middlesex District Attorney’s Office for over 25 years, Lynch is currently the Chief of the Homicide Unit and was previously division chief for the Cambridge region, supervising a Superior Court trial team and prosecuting homicides and other serious felonies. Tracy Miner ’85, Mintz Levin. A criminal defense attorney with the Boston firm of Mintz Levin, Miner specializes in white collar defense. She has litigated matters before the Office of the US Attorney, Department of the Attorney General, Bureau of Prisons, Department of Justice, and several other state and federal regulatory agencies. She represents major corporations and high-profile individuals. Nadine Pellegrini, US States Attorney’s Office. Assistant US Attorney Nadine Pellegrini is the former Chief of the Major Crimes Unit and a member of the Antiterrorism Unit. She joined the US Attorney’s Office in 1991, and has developed an expertise in wildlife protection. Formerly, she was the Chief of Special Prosecutions for the Massachusetts Attorney General’s Office. Marian Ryan ’79, Middlesex County District Attorney. Governor Deval Patrick appointed Ryan as the Middlesex District Attorney in April 2013. She is responsible for the prosecution of approximately 35,000 cases a year. She has been awarded the Lifetime Achievement Award from the Middlesex County Bar Association, and is the recipient of the BC Law David Nelson Public Service Award.